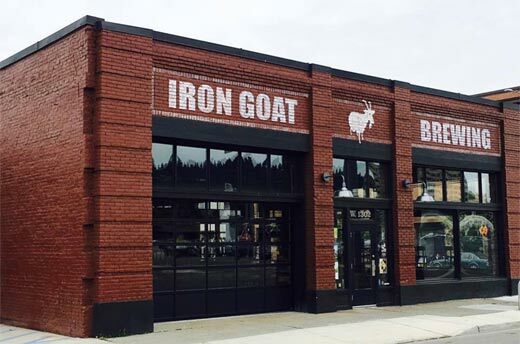 Iron Goat Brewing of Spokane is coming to the west side of the state. At last! The brewery makes its Seattle debut today, July 25th, at 5:00. Well, other than beer festivals, anyway. Today they’ll be at the Pine Box from 5:00 – 8:00. Tomorrow, July 26th, they’ll be at Chuck’s Hop Shop in Greenwood from 5:00 – 8:00. Finally, on Thursday they’ll be at CFRT in Auburn from 5:00 – 8:00. CRFT is a fairly new beer bar and bottleshop in Auburn, with 1,200 beers in bottles and cans along with 40 beers on tap. (I was just there last weekend for the first time. Cool place.) The beers are distributed by Click West. Iron Goat Brewing opened in 2012 on the east end of Spokane. Last year they moved into a larger space downtown (pictured above). If you’re wondering about the name, it hearkens back to Expo ’74, the world’s fair that took place in Spokane in 1974. The brewery is named after a garbage-eating goat sculpture at the fair.